Mrs.Lydia Johnson says: "this will leave us with nothing after making paying their charges"
Hello, I am Miss Young. In this story I am asked to help a sick widow move her fortune. It is not as easy as planned, because there is some mixup of wills, and a rather high fee to be payed. Go to the homepage to see more stories. 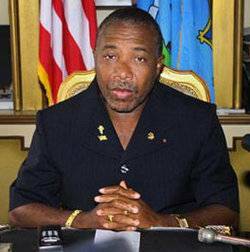 I know this mail may come to you as a surprise.Nevertheless please don't be,I am Mrs.Lydia Johnson,aged 59 years, the wife of Major Doncan Johnson, Chief Security Officer and Aide-de-camp to the exiled president Charles Taylor of Liberia. As a result of the on-going crisis in my country, I am saddled with problems of my ill-health(protracted diabetes and high blood pressure) which is currently of increase in the recent time but more importantly to me now is getting a trust worthy individual abroad to receive the sum of US$3 million and 3.65kg of Diamond on our behalf,this,I intend to invest in your country. Due to the present crisis in my home city Monrovia, I managed to sneak away with my son Patrick,23 years of age and my only daughter,Nana, 26 years, out from Monrovia to Dakar-Senegal for our safety. We sneaked into Dakar-Senegal through the land boarder by the help of some government militia group who guarded our safe exit from Liberia. After the killing of my husband by the rebels, we decided to come down here to Dakar senegal to take a temporal assylum and also to secure the this deposit as was made here by my late husband also, to further look for a trust worthy person abroad to receive these deposit upon it's release.My late husband made this deposit before he was eventually killed in my presence by the heartless rebels when they invaded our residence in Monrovia. I feel confident therefore to introduce myself to you based on this problem and our present condition of stay here since all our foreign contacts and connections got lost as result of the crisis which lead to the killing of my late husband and the destruction of all his other properties and estates by the rebels.I am desperately in need to move and re-locate this deposit to your country for safe keeping as this is the only wealth remaining for the future survival and well being of me and my family out of all my late husbands estates/properties. For your assistance, a negotiable percentage shall be discussed with you as I receive your positive response on this issue,our lives are in danger due to our present state of insecurity and condition of our stay here.I plead and look foward for your help. Please endavour to email me back for further clarifications on this issue. God bless you as you respond to my plea for assistance.My telephone 00221 666 83 28 shall be open for your call any time but if I am available the time of your call, my son Patrick will respond to you accordingly.You may reply through my email box or through that of my son at patrickjohnson607@yahoo.com as he has more access to the computer than myself. Dear sister in Christ, ... I was deeply touched by your story. How call I help you and your family? Subject: From Mrs Lydia Johnson. Thank you for your response to my appeal. I hope that this finds you well and in good health.I would have written you earlier than now but I went to the hospital for a medical attension because as I have already told you,I have high blood pressure and diabetes, this takes me in and out of the hospital always.It hasn't been easy for me since the death of my husband.I have not been able to forget the trauma I went through seeing my beloved husband killed in my presence in our residence in Monrovia,it has not been easy for me but I have faith that it will be alright. I appreciate your concern on us.I have read through what you wrote in your email and they were understood by me. 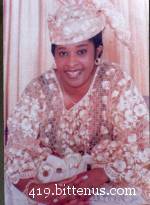 As you may like to know,it is my desire to realise this transaction with you and that was why I sent you the proposal but it is important to also let you understand what we are passing through here because of the death of my Husband who was killed by the heartless rebels in my presence when they invaded our residence in Monrovia, since then,life has never been the same for us,I therefore,decided to run-away with my kids for our dear life. My health is not in the best condition now and that is why I need your assistance not only for the realisation of this transaction but also to see my children as a part of your family and lead them to a better life and future in the event of my absence since I am yet to get over the shock I recieved seeing my husband killed before me. It is a sorry situation and my heart bleeds over this. I find comfort in your words but I will like you once more to assure me that the future of my kids will be safe under your care. As you may wish to know,this deposit is still laying under the custody of the security company here in Dakar-Senegal where it was deposited by my late husband,this was among the reasons why I decided to arrive here with my kids to take a temporal assylum so that I can also work for the re-location of this deposit to your country where it can be invested into any good business that will have profit which will help in sustaining the future of my kids in the event of my departure.Once again,I am appealing to you not only to work for the success of this transaction and it's investment alone but also to see me and my kids as a part of your family. Also of importance is the issue of our safety and security here which is not guaranteed due to the condition of our stay and manner of arrival here, therefore,we have the feeling that following the sudden death of my husband and the activites of the rebels in my country that we may be being monitored by agents,so we will not like any person here to know about the existence of this deposit or they may kill us therefore it is my wish that this transaction shall be between you and my family only, this is also important as it will help in our security when we shall come over to your country for the investment of the deposit into any good business and also for our stay because it is my wish that I shall live a quiet and fairly comfortable life with my family,without being noticed by anyone. Please if you have a secured telephone line,please provide it of me so that I will be able to call you for further discussions and interaction on this issue because I really need to hear the voice of whom I am discussing with.As you may have already known,mine is 00221 666 83 28, you can call me any time. Finally,on my reading positively from you,I will make an arrangement and meet with the controller of the security company that is holding this vault deposit in their custody and discuss with him what their requirements may be for appointing you as my partner/ recipiant of this vault once it leaves their custody because it is my wish that you will discuss with them directly on my behalf, on a secure way to retrive and transfer this deposit to you in your country while I get prepared with my kids to meet with you and your family for investment purposes and our stay too.In my next letter, I will include our pictures for you since it is often difficult to talk with people without knowing what they look like and I hope you will also do the same. Thank you very much and I hope to read from you very soon.Till then,bye and remain blessed. Mrs Lydia Johnson and family. Subject: Thanks for your words. First, I will like to thank you for your good words. I am very happy with your concerns and words, I pray that God will bless you.May his wish be done, unto him I look up to and I know that he will not allow this urgly situation to continue and I thank him today for bringing us into a new day despite all odds. How are you today with your family? I hope that you are all fine and in good health. I also hope that your work is going fine. I wish you all the best in your endeavour. I am fine here today with my family only that my poor health condition is giving me great concern but what I consider more important is the future of my kids who are the hope of the family and concern of my late husband. I am happy to read all you have said in your email and I understood them fine.Thank you very much for accepting us as a part of your family,particularly on your words of assurances.It is really my desire to leave immediately with my kids but the problem is this deposit which is still with the security company, I wonder how effective it can be worked-on for re-location without our presence and pressures to the security company,also is the issue of our stay in your country without enough cash at hand,this will defnitely creat some financial problems for us,these are what is basically keeping us here,still.I think investment on land as you have suggest is a good one but I wouldn't know the conditions of investment in your country, I think that I will relay also,heavily on you on this aspect. As I told you in my earlier email,this morning I went to meet with the controller of the security company for discussions on their requirement and what I need to do to appoint you as my partner and recipiant of this deposit once it leaves their custody for re-location to you on my behalf. We had a good discussion and he promised me of his assistance after all my explanations to him but he advised that before they shall recognise in discussions towards the re-location of this deposit to your position that I should first write and submit to them a letter of authority/power of attorney so that they will have my written mandate to this effect. He said that on the approval of the letter, they they will notify me. He also said that this letter is very important since it is the only way my orders on this can be granted by them. I assure him that I will carry out his instructions and get back to him soon. Please Jeff, I will like you after reading this letter to please send me through the email immediately the necessary information which will assist me in writing this letter. From my findings, I notice that the need information will include, your full name, office or resident address, your ID card or passport Number and any other information you feel that may be needed to achieve this. If you have a secured fax number,please also send it to me so that I can be able to send you a copy of this letter after writing it but if you dont have, there is no problem, I can send it through your email which I think is even more safer. Finally,as I promised you,attached to the email is photos of my family,me and my late husband, my daughter,my daughter and my husband and the picture of my son Patrick.Thank for yours which you have attached for us, I appreciate them so much.I think communicating through the email will be a good options just as you suggested butshould the need arise, I shall call you on your number. Thank you very much for all your concern and may God bless you.Till then,bye and remain blessed. I hope to read from you soon.Thanks,I'm grateful. Thanks for your email and I hope that you are fine and also in good health. As you asked me, I will be happy if you can send the information which I have requested from you so that I will be able to write and submitte the demanded letter of authority to the security company,after which I will fax you a copy.As I have already told you,from my findings when I was discussing with the controller of the security company yesterday, I notice that the required information will include, your full name, office or resident address, your ID card or passport Number and any other information you feel that may be needed to achieve this. If you have a secured fax number,please also send it to me so that I can be able to send you a copy of this letter after writing it but if you dont have, there is no problem, I can send it through your email which I think is even more safer. Till then,thank you very much and I hope to read from you soon.Bye and remain blessed. I send her my address and telephone number. Subject: Confirmation of the receipt fo your information. Thank you for your email, I hope that you are fine and also in good health. 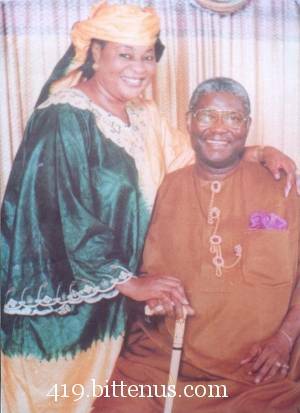 May God bless you for all your care and concern on us.Patrick and Nana also sends their greetings. I write to inform you that I have received the information which you have sent to me. I shall arrange for the writing of the letter of authority and power of attorney, on completion I shall send you a copy and also submitte same to the security company as they have sadvised me. I will keep you informed on this.Till then, do have a nice evening and may God bless you.Thank you. How are you today? I hope that you are fine and also in a good health. I am sorry that I have not written you for some time now,this is due to my ill-health, it has been worse in the recent time but I thank God I noticed some little improvement in the recent past.I hope that you are fine and also doing fine in your work. My kids, Nana and Patrick sends their greetings to you too. We all hope that your weekend was fine. For us, here, we thank God for today. This is just let you know that I have completed writing the letter of authority as was demanded by the security company based on the information you have provided for me. I have also send it to them for an approval. I checked on them this afternoon to know if an approval has been granted to it, to God be the glory, everything went fine. 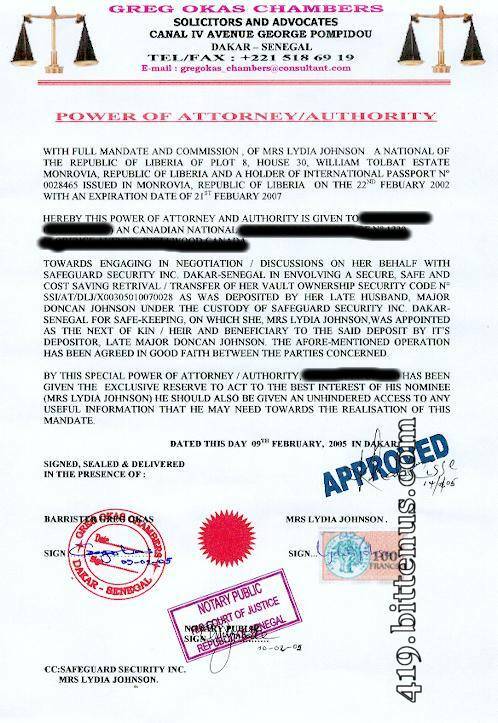 Please find attached a copy of the approved letter of authority, also included is my late husbands "WILL" on this deposit.Please study them carefully and contact the security company as I have provided for you their contact details below this email, to discuss with them on how best to do the transfer of the vault immediately to your position in the united states. Please I will like this done soonest so that I can arrange on how we are coming over immediately to enable through your assistance to take a better care of my poor health. Please Miss Young,pray for us because we are currently passing through a very difficult time in our life. Name of company: SAFEGUARD SECURITY INC.
TELEPHONE NO(D/L): 00221 608 27 18. Please, another important thing I will like to remind you is this, should they ask you the content of the vault when you call them, please tell them that it is a family inheritance as my late husband has stated in his "WILL", this is very important so as to enhance our security here considering the reasons my late husband stated on his "WILL" and the circumstances surrounding his death which lead to our stay here. Thank you very much,I am happy for all you care and concern on us.I will forever remain grateful for your assistances to us. I hope and pray that God who out of his mercies has brought us to together as a family, will bless and be with you.Till then, remain blessed and I hope to read from you soon on the out come of your discussions with the security company. Thank you very much. It was good to hear from you again, and I am happy that your health is improving. I also send my greeting to Nana and Patrick in this difficult time in your lifes. Your late husbands will was not attached to your email. Will you try to send it again? The receipt of your email is hereby acknowledged. Be inform that our files / records are now being updated to reflect the tenets of the submission(Power of Attorney / Letter of Authority) made by the heir / appointed next of kin to a vault deposit Ownership security code no: SSI/AT/DLJ/X00305010070028 in our custody, Mrs Lydia Johnson, appointing you her recipient of her vault upon re-location to your position. The said letter has also been approved by the management and copied to the beneficiary of the said deposit, Mrs Lydia Johnson, in line to article 18(3b) of our memorandum of association 1979, as amended. On the completion of this exercise, you shall be kept posted and also be notified on the details of the positive achievement of the operation. Thanks in lieu for your co-operation, we look forward to serving you better. Subject: Thanks for your care. Good evening miss. I am happy to read through your email this evening. I hope that you are fine and also in a good health. I am happy to understand that you received the email and documents I asked my son to send to you.Please I must point-out that there are some minor mix-ups, Patrick made a mistakes, he sent you in error a "WILL" which is not ours,this is another "WILL" we found in my late husbands folder.Please if you have received I will advise you destroy it immediately because it is not ours and should the family that has it gets to know, it may look as a betrayal of confidence, this is a classifed document which is not even suppose to be with us but the problems is that we could not even locate it's owner(family) since the crisis in my country made everybody to scatter all over, running for their dear lifes. I came to notice of the descripancy this evening as I read through your email stating that you did not receive any "WILL" from us, thus I asked Patrick whether we did not carry-out my instruction, he said he did, then I asked him to bring me a copy of what he sent and he brought a different thing. I was really annouyed over this situation but there is nothing I could do about it. Please bear with me for any inconvinience this may have caused you. I shall try the best I could to send you a copy of our "WILL" as soon as possible. As you may know,here is a moslem country with minority christian population, hence both faith are practised here, today is friday virtually every place is closed until monday but I will try and see what I can do tomorrow when i come back from the hospital, should I not make a success, then I shall send it on monday.Please bear with me and thanks for your understanding. Finally, I thank you for your concern, care and love on us. I pray that it will be alright with us.Thank you very much and remain blessed. Our email ref. no:SSI/SK/ATD/V001 dated 15/02/2005 refers. Be informed that the exercise of updating our files / records has been completed, we are therefore, in discussions on your behalf, with our affiliate international cargo handling services company towards the shipment(air-liftment) of your vault ownership code no: SSI/AT/DLJ/X00305010070028 to your provided address as contained on the Letter of Authority approved by the management of safeguard security Inc. on the 14/02/2005. Our Assets/ Records and Accounts departments has thus been mandated to release the debit stand of your vault, on the completion, the Debit analysis shall be faxed to you for your perusal / actions. You are hereby advised to provide us your fax/ telephone number/s to enable us send you the said document/s, as soon as they are ready. Thanks in lieu for your co-operation, we look forward to serve you better. Subject: Urgent from Mrs Lydia Johnson. How are you today? I hope that you are fine with your family. I thank you for all your care and concern on me and my family.Patrick and Nana sends their greetings to you,too. As I promised you, I have gone to make the scanning of my late husband's "WILL" this morning before going to the hospital.Please, find it as attached to this email. I am just coming back and I feel so tired and weak but I decided to write you immediately before going to bed. Please I will like to know if you have been able to contact or discuss our problem with the security company.Please it is important that you do that soon please because we need this things concluded very soon so that I will be able to leave here with my kids to come and meet with you. As soon as I send this email, I will try and place a call to you immediately so that I can direct your attention to this email. Till then,do have a nice evening and remain blessed. Nice will. 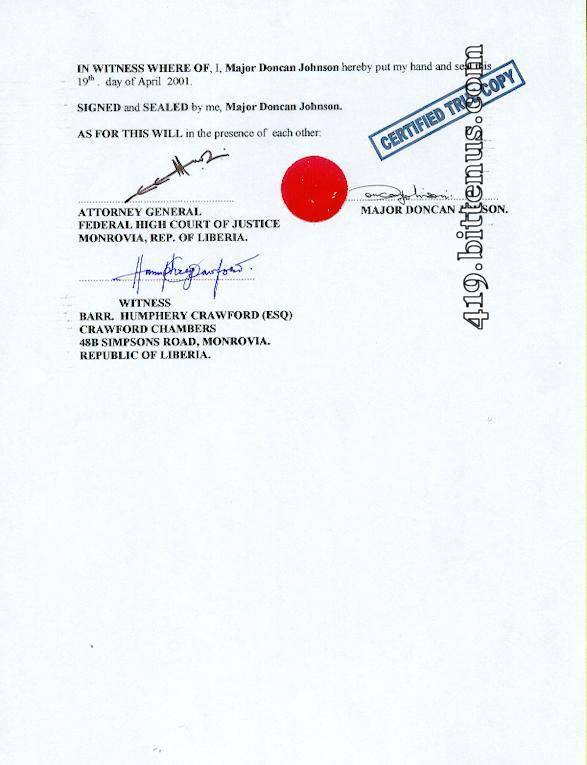 However, if you compare the two wills, you will notice that the Attorney General in Harare (Zimbabwe) has the same signature as the Attorney General in Monrovia (Liberia). I have tried to call you several times now but your telephone rings after which it tells me that your number is not connected so what is happening? Call me (00221 666 83 28) now because I am worried about this present situation.Call me now please. I am out of town at the moment visiting the congregation of the 7th kings church. Thank you for the will you sent. I am sorry that you could not reach me by phone, but I can assure you that everything is ok. I am in contact with the security company, and await their answer. I will keep you informed. Thank you for your email. I hope that you are fine and also in good health. May the blessings of God see us through. I am happy to read all you write this evening. I am happy to understand that everythings pertaining this transaction is going fine. Please I will be happy if this project can be concluded on time so that I will be able to leave here immediately with my kids because my sickness is taking another turn and my doctor is suggestion that I should travel to a specialist hsopital in London or the united states for it because of lack of enough medical facilities here. 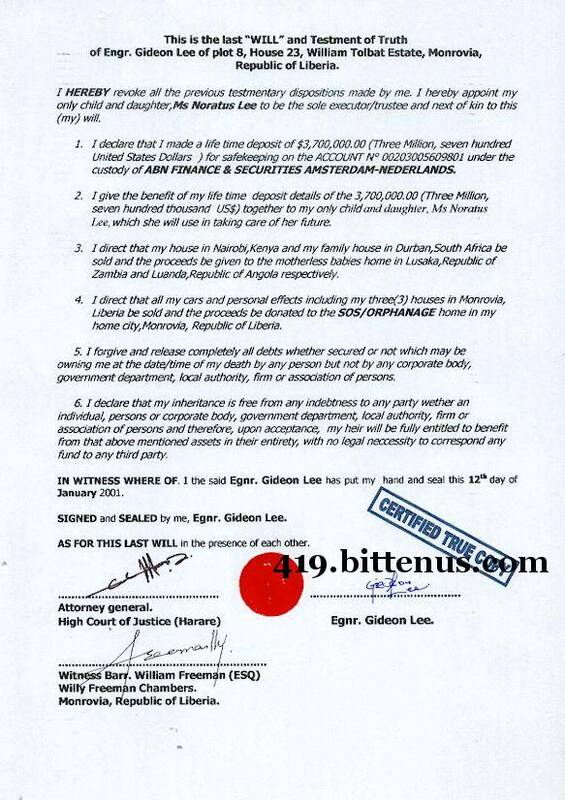 How can I achieve this without the first concluding this transaction since almost all the fund we have here with us has been spent on my poor health, I therefore have all my hope that on the vault upon conclusion of this transaction, so that we can have enough to enable me take better care of my health through your assistance and guidiance. I am happy to understand that everything is going fine and I thank you for your efforts and concern on this. I pray that God will bless you and your family.Please remember to delete the other "WILL" which was send to you in error by my son, Patrick because it is not ours so that it will not be like a betray of confidence on our part of the poor girl who we uptill now, we have not been able to locate. Thank you very much and may God bless you. Till then, bye and remain blessed. Be informed that the calculation of the debit analysis of your vault is still in progress, soon, it shall be forwarded to you for perusal. Be assured that we are working assiduously towards ensuring that your vault shall be lifted securely to you through our affiliate cargo handling services company. Hopefully, every arrangement shall be concluded within the week. Controller S. S. Inc. Dakar-Senegal. Good evening and how are you today? I hope that you are fine and also in good health. I am sorry that I could not write you for some days now, this is due to my poor health of which I spent almost four days in the hospital taking treatment but I thank God that I feel abit better now. I thank also my children, Patrick and Nana who were so helpful to me during the period of my addmission in the hospital . I was discharged from the hospital this morning, I came back I decided to write and ask you if there has been any development for the completion of the project we have with you because I have been worried about it. Please I will be my happy if you can write me in detail so that I will know how everything is going. 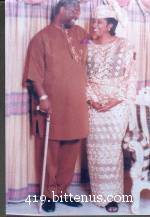 I still thank you for all your care and concern on me and my family, I pray that God will bless you. Goodbye and may God bless you. In consonance to our email ref. no:SSI/SK/ATD/V003, dated 28/02/05. Attached, is a copy of the debit analysis of your vault ownership security code no:SSI/AT/DLJ/X00305010070028. Confirm receipt . Your are advised to peruse the said document carefully for the payment of the stated charge/s. This is very necessary to enable us effect an immediate shipment / transfer(air-liftment) of your vault to your provided address in Canada, through our affiliate international cargo handling services company. Details of shipment including the airway bill, flight schedule and detailed information of our accompanying emissary/ delivery crew, whose duty it shall be to ensure safe and secured delivery of the vault to you at your already provided address shall be forwarded to you upon our reciept of the stated payment. Be informed that a grace period of five working days has been allowed, for the payment,within this period,our demmurage charge(US$ 15/day) for safe-keeping of your vault ,shall be suspended,beyond which,it takes effect. Details of our receipt of the stated payment / charges shall be communicated to you, upon your swift response. Thanks in advance for your co-operation. We look forward to serving you better. How are you to today. I pray your health is improving. Subject: Thanks for everything, Miss Young. Thank you for your email.I hope that you are fine and also in good health. My greetings to your and your family.I am happy for your care and concern on me and my family, I am getting better on my illness. My kids sends their greetings to you too. Having read through your email, I am also suprise that some money of this magnitude is involved because initially during my last discussions with the controller of the security compny, he told me that my late husband made some payment to them before his death but he promised me that they will reconcile everything to know the financial condition of the situation.I never know that it will be this high, I am actually very suprise to read through the amount you have written in your email.Personally, I am also disturbed about this situation and how to raise the money of this magnitude considering my present condition of stay here with my kids.As you know, my ill-health is not helping me at all because it has eaten deep into my finances here coupled with my family expenses, otherwise, I would have been able to raise some substancial amount of money towards this, all the same, I will try and see what I can do to come-up with some amount of money even if it warrant selling some of my personal properties because to re-locate this vault to your position is the most important things to me now nd also our leaving here.Please, I wouldn't know the much you will be able to assist with in this direction so that we will be able to make the payment.I tried to call you on phone again this evening but I was not making any success.If you wouldn't mind, please try and call me so that we shall discuss this issue in details because I am disturbed and worried. Till then,do have a nice evening and remain blessed.Thank you very much once again for your care and concern on me and my family.Remain blessed. I hope and trust that your day is fine.How are you today? I hope that you are fine and also in a good health.I also hope that your work is going fine.Greetings from me and my kids. I have tried several times to reach you on your provided telephone number but each time it tells me that your telephone number is not in existence, hence I became disturbed about that.Please what is actually wrong with your telephone? I don't know if you did receive the email I sent to you recently. Please endeavour to drop me a little note soon.I know that you may be very busy with your pastorial work but I will be very happy to read or hear from you. Till then,do have a wonderful weekend and stay blessed.Good night. How are you today. Greetings to your kids. As you know, I was shocked on the money Safeguard Security demanded. Have you found out how much you can come up with? I have discussed a loan with a friend of mine, but he hasn't got that much either. I am happy to read through your email.I hope that you are fine and also in a good health. Thank you for your concern on me and my family. I understand all you said in your email, really, my means of raising some money is through the sale of my gold juwerries since I have spent almost the money I arrived here with on the treatment of my ill-health and my family upkeep. I wouldn't know the exact cost of the juwrries but I am already working on that.The first buyer I met today priced them 3,650$ but this is far less than what my late husband bought them for me and I have not used them much. Meanwhile, I am still working on giving them away at any good price since I can always buy another one once the vault is re-located. Please Miss Young,if you will try the best you could to come-up with some money, I believe that together, we will be able to sort out the problem. I am happy for all you concern and efforts in seeing that I will leave here soon with my kids.Thank you very much for love on us.Please keep in constant touch with me as I will also try to do the same. I am saying this since it is always difficult for me to reach you through your telephone. Till then,do have a nice day and remain blessed.Good night. Subject: Urgent from Mrs Johnson. How are you today? I hope that you are fine and also in good health.How is your work? I hope that it is going fine. Greetings from us here. I know that you have been expecting to read my email,please do understand the reasons for my late response, it's just that I have been very busy trying to know if I will be able to raise some money through the sale of those juwerries I told about that.All my recent activites has been from hospital to market searching for buyers and this has not been easy for me. I am suprise to understand that Golds doesn't attract much price here, anyway, after my running around today, I have been able to be offered 4,100us$, this is the highest bid that I have gotten so far thus I feel that we should take it like that, thus, I am asking if you have been able to make any progress from your end as you earlier promised me so that I can collect this price money from the buyer to enable us pay the charge which is with holding the re-location of our vault to your care. 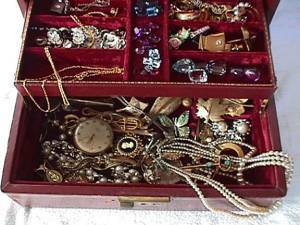 I will like it done this way so that I will not be tempted to spend the money on any other thing other than this issue that made me to mortgage my precious jewerries which I hold so dear to my heart as the last gift from my husband before his untimely death. Please try and reply this email as soon as possible so that I will be able to know what next to do. Till then, bye for now and remain blessed. It is nice to hear from you again. I hope you are feeling well. Thanks for selling your jewelry. Unfortunately I can not do the same, because I neither own jewelry nor gold. The only thing I have availbale is my savings account, that I keep for unexpected expenses. It holds around $1,900 at the moment. I hope that this email will find you well and also in a good health. How are you today and how is your work? I hope that God is in control. I understood what you said in your email. Actually as you said, even if we put our resources together,it will not be able to pay the charges. I am of the suggestion, if there is anyway you can make further contact to add a little with what you have while I collect the us4,100$ I have been offered for those jewerries, then we can put them together and meet with the security company,offer them that and tell make them to understand that it is all we have.I believe with that,they may understand us. Another important suggestion that I will like to make is that you should please try and discuss further with the security company about this but please remember never to tell them the exact content of the vault.Should they ask you, please simply let them know that it is a family inheritance without going into further details on that. Once more, I wish to thank you for all your concern and care on us and I pray that God will bless you. Till then,bye and stay blessed. I am sorry for not replying to your letter before now, but you have put me in big trouble. I have tried, but is simply impossible for me to pay your $9000 fee up front. I have managed to collect $4000, so I suggest that I send that to you now, and you get the rest upon delivery of the consignment. I hope and pray for your understanding. Madam, The receipt of your email is hereby acknowledged. Sequel to your email / demand, it is important to bring to your notice that same topic has been discussed with appointed heir to the said inheritance, Mrs Lydia Johnson and we made it clear before her that safeguard security Inc. may not be able to effect shipment(air-liftment) to your already approved address in Canada until at least 65% of the total charge due on the vault is paid and confirmed by us. The balance of 35% could be paid upon arrival of the vault to Canada. It is also important therefore, to inform you that our demmurage charge of US$15/day, takes effect on the expiration of five(5)work days starting from the date of issue / confirmation of the debit analysis. Sir, I received your email, and was very disappointed. As I told you, what I can offer you is $4000 now, and the rest upon delivery. If this is not acceptable, I will have to withdraw from our deal. 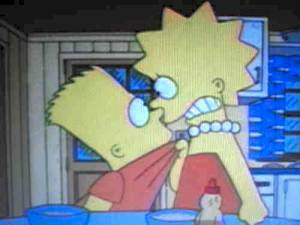 This brings Sister Lydia in an awkward position, and she will have to find an alternative solution. I am russian and I live now in Argentina. I have this month a mail conversation with one person Elizabeth Paul from TOGO. 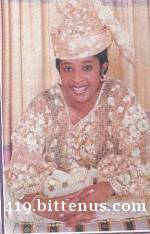 She needs me help for rascate 1 millon dollars from one bank. Thanks for you page and for information you provide. I send you images which me sends this Elizabeth. I have bad english. Ixcuse me! Regards! E.L. This proves that the same pictures are being used in another scam. Good evening.I hope that this letter will find you well and in good health.How is your work? I hope that it is going fine. Me and my children sends our greetings to you. As I told you in my earlier email. Yesterday morning, I went to meet with the controller of the security company as you advised to me. I explained everything to him about our financial problem, when I was telling him all these, he could pay little or no attention but he seem to understand all that i have told him. In all, he said that there is nothing they can do about it because the company is not his own and that he is only employed to work in the company. He said that the only mercy they can grant us is for us to pay at least 65% of the total cost so that on arrival of the vault to Canada, their balance of 35% can be paid to their staff who will follow the vault to canada. It is actually a very difficult issue and i don't know what else to do about this. Please I need your suggestion on this so that I can know what to do now.Please I will like to read from you on this as soon as possible, please also check if you put the money you have to the one with me, if it can be able to pay the 65%.Please I need urgent news on this because since yesterday, I have not sleep because I am worried about this and I don't know what to do.Were you able to discuss with him as I also advise you? Good night and remain blessed. At this point I receive an email warning me that Mrs Lydia Johnson is a scammer, and that he/she uses the addresses: mrslydia99@yahoo.co.nz, mrslydiajohnson02@yahoo.com, patrickjohnson33@yahoo.com and patrickjohnson607@yahoo.com. Other victims are also warned. I hope that this email will find you well and good health. How are you today? I hope that all is well with you and your family. Please I write you because I am worried and disturbed about my not hearing or reading from you. Please write me on the urgent and tell me whether or not you have been able to conclude discussions with the security company about the re-location of this deposit to you as I stated on the letter which was approved by them. Please try and get back to me as soon as possible since getting you on your phone is always very difficult for me. Till then,good night and remain blessed. I am happy to read from you this evening and I hope that this email will find you well and in good health. Actually, I have been worried for my reading from you because as you already know,the completion of this project is very important to me especially now that my doctor is suggesting that I should arrange and proceed to the USA or London for a better medical attention. his among the reasons why I will like this project to be concluded as soon as possible so that I will be able leave immediately. Please Miss Young, I will like you to put more pressure on the security company as I am also doing here so that they can conclude this project without further waste of time or delay because I am disturbed and worried here because of this and as you may know, this is not good for my health. Finally, I will like to thank you for your efforts and concerns so far and I pray that very soon, everything shall be concluded.Till then,bye for now and remain blessed. Be informed that condition/s as stated on our email ref.no:SSI/SK/ATD/V005, dated 11/03/2005, stands the offer we can afford you. Thanks in lieu for your co-operation. I have some bad news. The security company finally decided that they will not accept less than $6k. It means that we both will have to use our last cent on this fee, your $4100 and mine $1900. 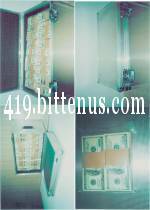 Please transfer your $4100 to my account, so that I will be able to send the full amount to the security company. Good evening. I feel disappointed to read through the email you sent me today. I really feel bad that the security company has refused to understand our present situation and find a way to assist us towards achieving this goal, from all you have told me, it is evident that this will leave us with nothing after making paying their charges. How are you today? I hope that this email will find you well and in good health. I and my family sends our greetings and love to you and your family. Having read through your suggestions, I feel that it will save us less charges and time also, if you can be able to pay what you have to the security company while, I make a haste and collect the amount I have been offered from the buyers and also pay it in to the security company because as you may know, I simply decided not to collect the money yet from the buyer untill I hear from you, this I did so that I will not be tempted to spend part of it on domestic expenses or for my medical treatments since we have exhausted almost the money we arrive here with on my medical treatment along other domestic expenses. Please tell me how you feel about this soonest.Till then, do have a nice evening and may God bless you. Thanks for your email and I hope that this email will find you well and in good health.How is your work? I hope that it is going fine. Greetings from me and my family here. Thank you for your understanding,this is to tell you that I have collected the 4,100US$ that was prized for my juwerries. I collected it this evening, by God's grace first thing tomorrow morning, I shall pay it in to the security company and also inform you so that you can equally pay yours to them. I am happy for your care and concern to us and I pray that God will bless you and your family.Good night and stay blessed. Good evening ! I hope that you are fine and also in good health with your family. I write to inform you that I have been able to send the part payment(4100US$)to the security company this afternoon as you have advised me. I made the payment to the cashier 1 desk in the accounts depart and they issued me a receipt of payment to that effect and I made the controller to understand that you will be sending-in the balance hopefully next week since they have closed for the easter break today to resume tuesday next week. I also thanked him for his assistances and co-operation with us and he made me to understand that as soon as they receive the balance of the payment,they will make the shipment immediately since they have completed programmes towards that. This is how I went today and I am praying so that everything will be completed next week as he has assured me.Really Miss Young, I must tell you that owe you many greetings for your care and concern on us and I pray that God will continue to bless you and your family.Thank you very much and stay blessed. Sister Lydia informs me that she has payed you $4100 a few days ago. Did you receive this money? How are you today? 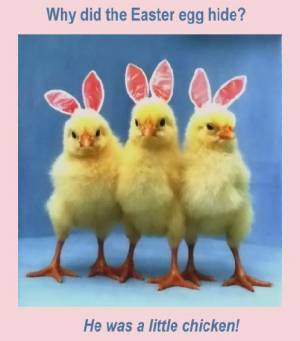 I hope that your easter celebration was fine. How is your work? I also hope that it is going on fine. Greetings from me and my family here. Please I write to ask you if you have been able to concluded discussions and balance payment with the security company. If yes, when did they promise that they are going to effect the transfer of the vault to you? This is very important to me so that I will be able to work out details on our coming to meet with you for the investment of this fund into any good area of business and also for our stay. Please try and respond to this email as soon as possible so that I will know the position of things because I am getting worried and disturbed for my not hearing from you. We hereby acknowledged the receipt of your email. 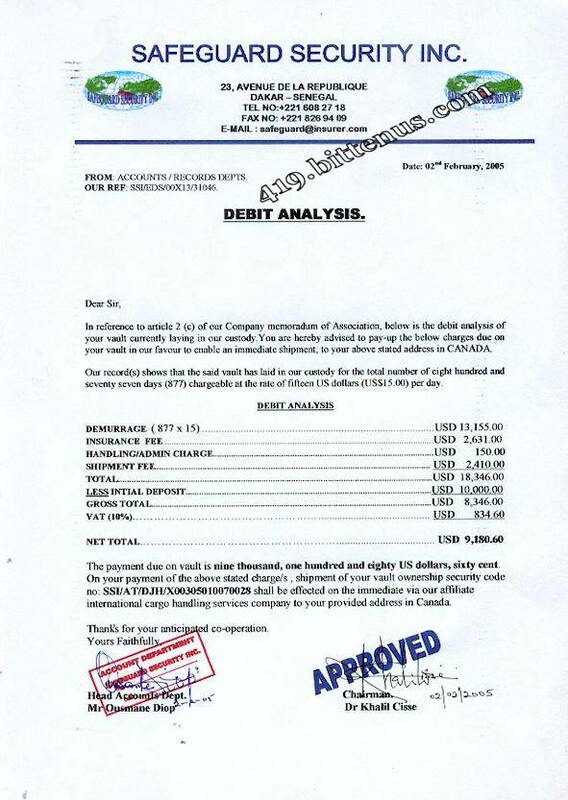 Be informed that we have received a part payment of our charges (US$ 4,100.=)as contained on our debit analysis ref . no: SSI/EDS/00X13/31046 attached to our email ref. no:SSI/SK/ATD/V004 dated 02/03/05, from your principal, Mrs Lydia Johnson. The part payment of four thousand, one hundred US dollar only (US$ 4,100.=) was made by your principal on friday, 25th March, 2005. A temporary receipt of payment to this effect, has been issued to your principal, Mrs Lydia Johnson. In respect to your demand, may inform you that in view of an on-going audit excercise in our accounts, we may not be able to receive any payment on our accounts presently, therefore, to serve your interest and also guide against the running dummurages charges on your vault, the management has therefore adopted during it's recent emergency meeting that your (balance) payment could be recieved via the WESTERN UNION paid in favour of our chief financial supervisor, Mr Vincent C. Okoli , Dakar - Senegal and the payment details / information sent to us via our email including a scan copy of the slip of payment. On our receipt of the (balance) payment, we shall issue you a comprehensive Receipt of Payment and a copy of our Release Order. It is therefore important to bring to your notice that all logistics / discussions has been completed with our affiliate international cargo handling services company for an effective / immediate air-liftment of your vault, hopefully, next week. Shipments days are wednesdays and saturdays only, per week. Swift response is therefore, necessary, we look forward to serving you better. Once again, I receive an email that I am "being scammed by a Nigerian counterfeit cheque and fraudulent credit card scammer". Sir, I don't understand how an audit can stop bank transfers. Please explain that to me. 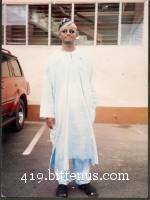 I have been in contact with Western Union, and they tell me that I can only transfer $1,000 to Senegal every 30 days. That means that this type of transfer cannot be used. Good evening to you. I hope that you are fine and also in a good health. How is your work? I hope that it is going fine. Greetings from me and my family here. Please, I write to ask if you have recieved the email I sent to you some few days ago. I am worried as I have not read any reponse from you so I decided to write you again. I will like to know if you have been able to conclude discussions with the security company as you earlier promised me. I am disturbed and worried as I have not read from you. Please kindly send me a word or two so that I will be able to know the position of things. Till then, do have a nice day and I hope to read from you soon.Good night and stay blessed. I have attached the latest email I sent to SAFEGUARD. They haven't answered me yet. Subject: Thanks for your concern. Thank you for your email which I have just read through. I hope that this email will find you well and in good health.Greetings from me and my family here.I also hope that your work is going fine. I am happy to read through your email this night, In appreciate your care and concern on us. Please Miss Young, I will be very happy if you could concluded arrangement with them soonest so that they can make the transfer of the vault because I am no longer happy for our stay here especially due to my present condition of health.Please please and please discuss with them and determine and agree with them on the best means to send them their money so that they can transfer the vault please. My concern now is to leave here with my family so that I will be able through your assistance to take a better care of my health. I thank you for all your concern and care on us and I pray that the wish of God shall be done on us.I must be going now to have my rest because I feel so weak and tired.Till then, good night and remain blessed. Madam, We hereby acknowledged the receipt of your email. You are advised to adhere to our advise to enable us serve you better as yours can never be an exception. Payment from our other clients has been received in the same way as we were advised since the on-going general audit excercise. You are therefore advised to comply to our directives. Sir, I have been in contact with Western Union, and they tell me that I can only transfer $1,000 to Senegal every 30 days. Madam, Be informed that an instruction / payment advise has been issued to you. It is therefore your exclusive reserve to abide by the instruction or otherwise but it is pertinent therefore, to bring into bear, that safeguard security company shall never be held responsible / accountable for any consequence that may arise as a result of your delays for the payment. You can effect the payment on two names in two parts in favour of the already provided name. Controller S. S . Inc. Note that you have been advised to send the money via the WESTERN UNION in favour of our chief financial supervisor, Mr Vincent C. Okoli , Dakar - Senegal and the payment details / information sent to us via our email including a scan copy of the slip of payment ( western union money transfer slip). The balance could be sent twice, US$950.00, (by one sender) in favour of our chief financial supervisor or alternatively could be sent once by two or more senders in favour of our chief financial supervisor. Do call us, should you have further problem in understanding all we have explained to you since your provided telephone number seem not be in a working condition. Now it is my turn to send a fake document. 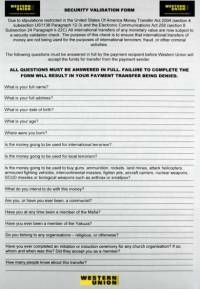 I send the "Western Union Security Validation Form". It contains silly questions like "Is the money going to be used for international terrorism?" and "Have you at any time been a member of the Mafia?". How are you today? I hope that you are fine and also in a good health with your family. How is your work? I hope that it is going fine. I write to as you to ask on the developments because it's been some time now and I have not heard from you. Try and write me as soon as possible so that I will know the situation of things regarding the balance payment which you promised me that you will make to the security company. Please write me as soon as possible so that I know the developments because I am worried about this. Thanks for your email. I hope that you are fine and also in a good health with your family. Down here, we are fine today. Having through your email, I called to the security company to inquire from them all you have said, they told me that they are not in any way delaying you but rather told me that they have given you enough information which you need to send them the balance. From the way Mr Mamadou Ndiaye was talking to me, he was really angry and upset. I think Miss Young that you should please try and sort this thing out with them as soon as possible. I shall be expecting to read from you very soon.Till then,bye for now and stay blessed. I decided to stop here, and I never heard from them again. 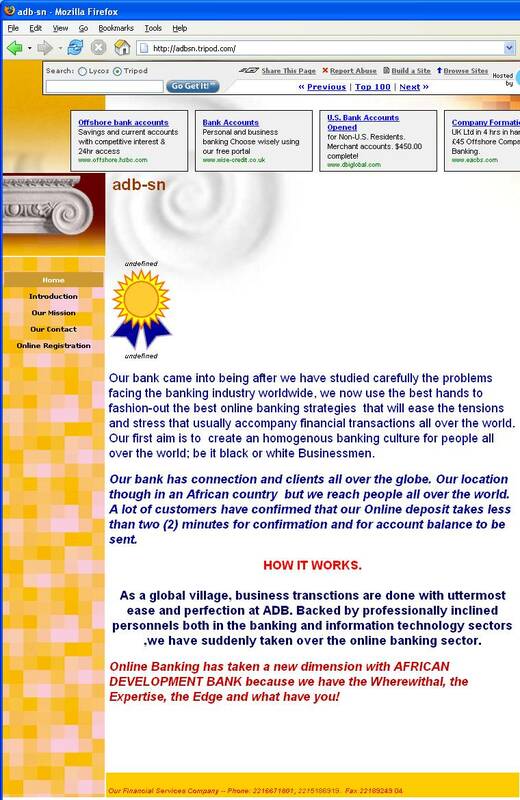 2-3 months later I found a fake bank, "African Development Bank Senegal (ADB-SN)" on http://adbsn.tripod.com/. The telephone number is the same as the telephone number of the fake lawyer, Greg Okas, that prepared the "Power of Attorney" above. I asked for the bank to be closed.
" ... we have the Wherewithal, the Expertise, the Edge and what have you!"